Here is the 20 year old Supertrapp muffler I just put on my Virago 250. One thing I learned is that Supertrapp mufflers are great for someone who does not want to fool with carburetors and changing jets. They have removable plates – mine came with eight of them – if your bike is running rich you add plates to lean it down; if it is running lean, you remove plates. The plates are put in with the open side facing the rear of the muffler. You add discs to make it louder and reduce back pressure. You remove discs to make it quieter and increase back pressure and torque. 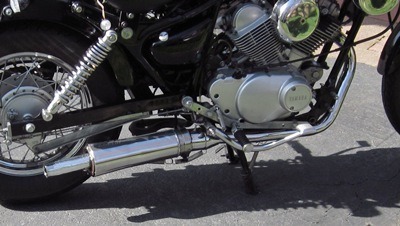 Since I was using only one of the original mufflers, and it was in the lower position, it really fit well – sort of halfway tucked under the bike. 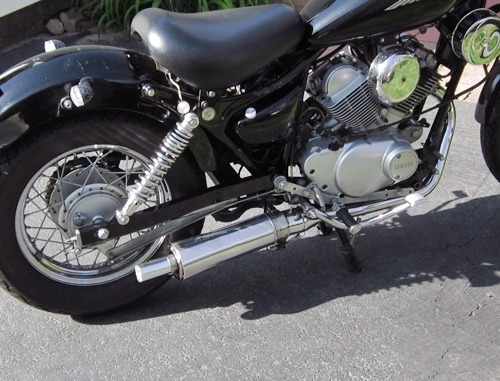 The original Virago 250 muffler is 2 3/4 inch wide; this Supertrapp muffler is 4 inches wide – because it is wider, it does not fit the bike as well as the stock one but it looks totally ________. Due to it’s width, I had to angle it away from the bike a small amount (about 10 or 15 degrees). 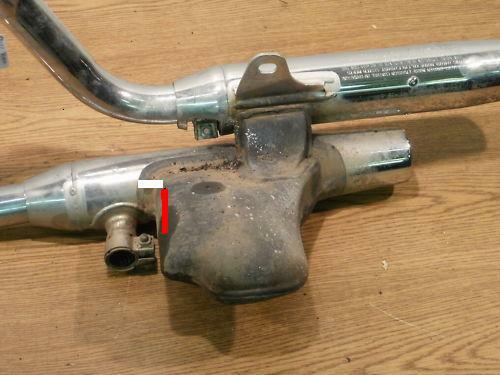 (step 1) Start by cutting the lower muffler about 19mm or 3/4 inch after the back cylinder pipe junction (see red mark in picture) – you will no longer need the rear part of the muffler assembly (6.5 lbs or 2.95 kg) that you just cut off. You are converting from the look of a 2-to-2 exhaust to the look of a 2-to-1 exhaust, so you will no longer need the rear chrome non-functional pipe which weighs 0.45 kg (1.0 lb). Only one cut is needed. ……. (step 2) After you cut the pipe, you will be using only the front section, which you need to cleanup by using a grinder to make the outside of the last 30mm of the pipe completely round. 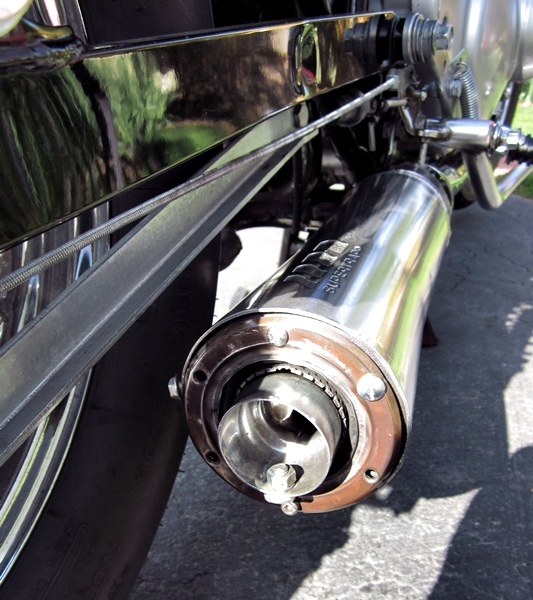 In other words, grind off the bumps so a larger muffler could be slid onto the pipe. Due to the back cylinder pipe junction, you will be able to slide a muffler only about 30mm or 1 1/4 inch onto the pipe, so you do not need to cleanup any more than that. ……. (step 3) You need to make a rounded notch about 30mm x 11mm (1 1/8 inch x ½ inch) in the muffler that you will be putting on – the notch needs to be exactly where the muffler contacts the back cylinder pipe junction. If you are working with an older Supertrapp, be careful with the end cap bolts. They are very long (56 mm) to accommodate extra plates – the threads on mine were good near the end but were damaged further up, so as I put them all the way in, it broke loose some of the fasteners inside the muffler. I will have to use large screws for those (have to drill out the plates to fit the bigger screws) – but that’s OK – I am not real concerned about looks. I only have 8 plates so I reduced my two “good” bolts to 40 mm length. The bolts are aluminum – the bolts would be more durable if they were steel – but I’m sure the company had a good reason to use aluminum. Since the Supertrapp that I have (3 inch ID inlet) is bigger than the 2 3/4 inch Virago muffler, I cut a piece of the mid-pipe that came with it to use as a collar to improve the fit. When I first put it on, it had an exhaust leak. I used a muffler patch to fix that, but that made things more complicated as I had to slide on a patch, the mid-pipe collar, another patch, and then the muffler. Then I decided to put in one retaining screw and drilling through the collar was really hard – like the muffler, it is aluminum but I think it is specially hardened or something. If I had to do it again, I might just forget the collar and make a few more cuts in the muffler so it would tighten down more to fit. My Supertrapp muffler is 4 inches wide, 13.5 inches long (102 mm x 343 mm), has an inlet ID of about 3 inches (76 mm), and weighs 3.25 pounds (1.47 kg). 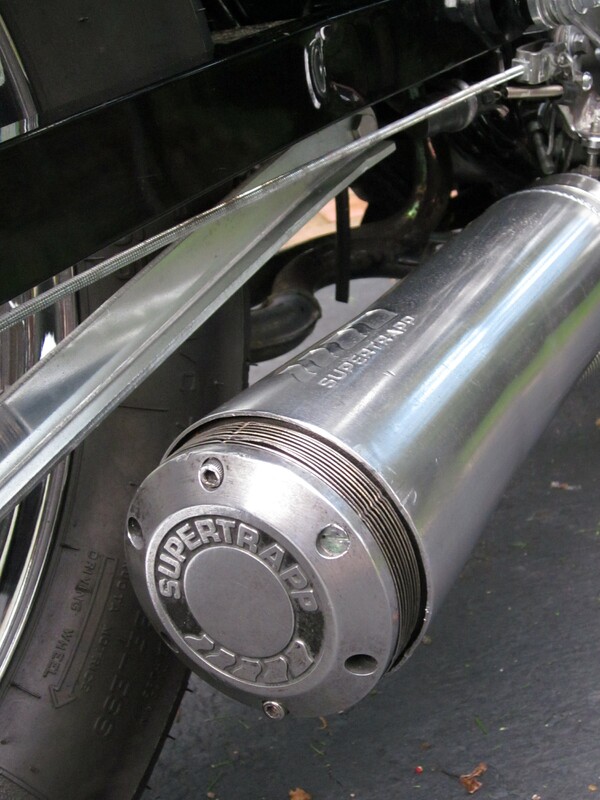 13) added April 12, 2012 – I changed my Supertrapp muffler from side firing to rear-firing. 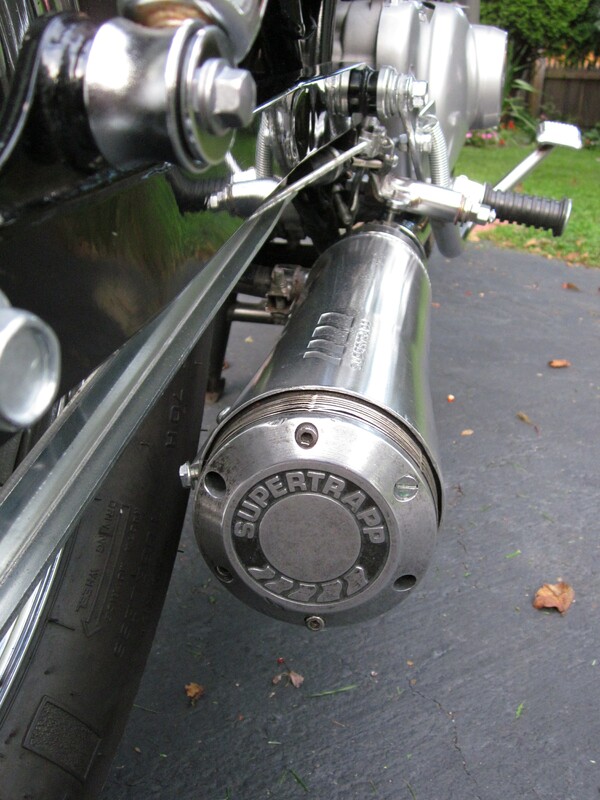 With Supertrapp mufflers that have a solid endcap, the exhaust is directed to the side – this is good because traffic around you can hear you better, but bad because it is louder for the rider. When I get home (47 mile commute), my ears are always ringing – I wear earplugs now and I added some noise insulation to my helmet, but that was not enough. Also, I crank up in the mornings with the bike backed up against some blankets so I don’t wake up the neighbors, so it would be good if the bike was not so loud. I removed the end cap and plates and put in a 12 inch baffle. I also sealed a few exhaust leaks. It sounds quieter now and the popping on deceleration is much better. It does not look so great, so I have to figure out how to cut a perfect circle in the aluminum end cap so I can put it back on. The way that the baffle fits, it sticks out about .75 inch – I like that look, so I might add a longer extension to it. The 2nd and 3rd pictures below are mock-ups of a 4 inch and 5.5 inch extension, so I could see how it would look. update – I cut the original chrome “fake” pipe (1 5/8 inches OD) to make a 4.5 inch curved extension. At first it was 5.5 inches – it was too long, so after it scraped in two corners, I cut an inch off. After setting the pilot screw to 1 turn out and adding the twelve inch baffle to the exhaust, the bike definitely has more torque. It goes up some hills in 5th that needed 4th before. edit Oct 6, 2012 – I seldom do things based on looks, but today I changed back to the Supertrapp endcap. I only used 4 discs and I removed 40% of the middle two discs to make a bottom-facing slot (so most the noise will do downward away from the rider). I just did a short test run but I think the “bottom-facing slot” is almost as good as “rear-firing” in reducing exhaust noise to the rider. This entry was posted in Motorcycles and tagged how to make virago 250 sound better, Supertrapp, Supertrapp Virago, Virago 250 exhaust, Virago 250 exhaust mods, virago 250 loud muffler, Virago 250 modifications, Virago 250 mods, Virago 250 muffler mod, virago 250 sound, Virago 250 updates, XV250 exhaust mods. Bookmark the permalink.